Tyddyn Sargent is set in the unspoilt Welsh countryside, just a mile from Benllech beach and a short drive from the heart of Snowdonia. The splendid two lakes are not only beautiful and relaxing to be near, are also well stocked with Coarse fish and is surely one of the best places to enjoy the sport of fishing. 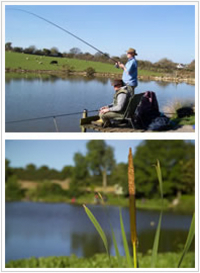 Whether you are looking for a peaceful fishing break, Lakehouse Holidays at Tyddyn Sargent can accommodate your needs.